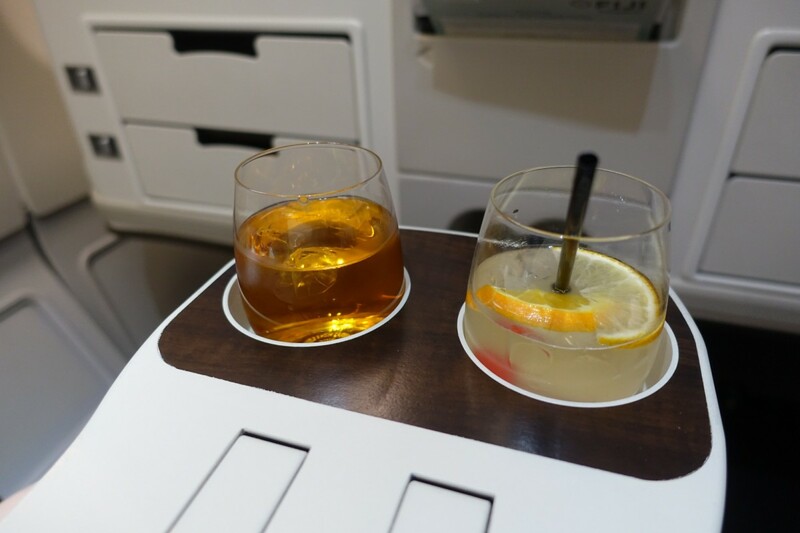 This Fiji Airways Business Class Review, A330-200 is from our 2017 flight from Nadi, Fiji to Los Angeles, LAX, after our stay at Laucala Island Resort. 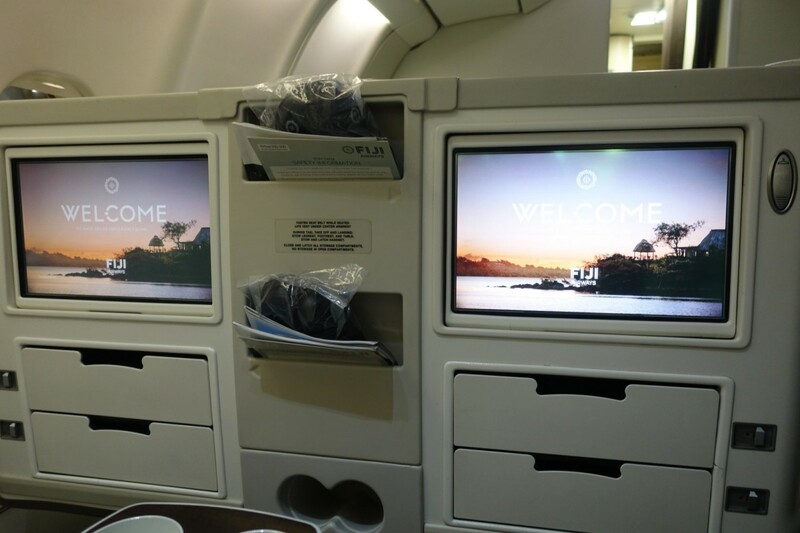 We also took Fiji Airways last year, and you can see our prior Fiji Airways Business Class Review. 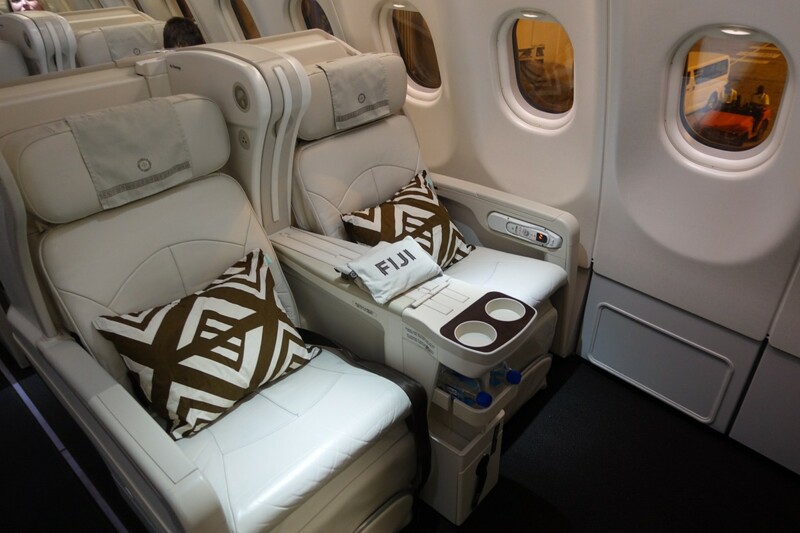 Fiji Airways A330-200 Business Class cabin has 24 seats in a 2-2-2 configuration across 4 rows. For a red eye flight such as ours, I recommend either choosing a window seat for more privacy (but only if you don't anticipate needing to get up during the night, as it's awkward to climb over your seatmate once the seat is greatly reclined or in bed mode) or selecting one of the two middle seats, since these have direct aisle access and you won't have anyone climbing over you. 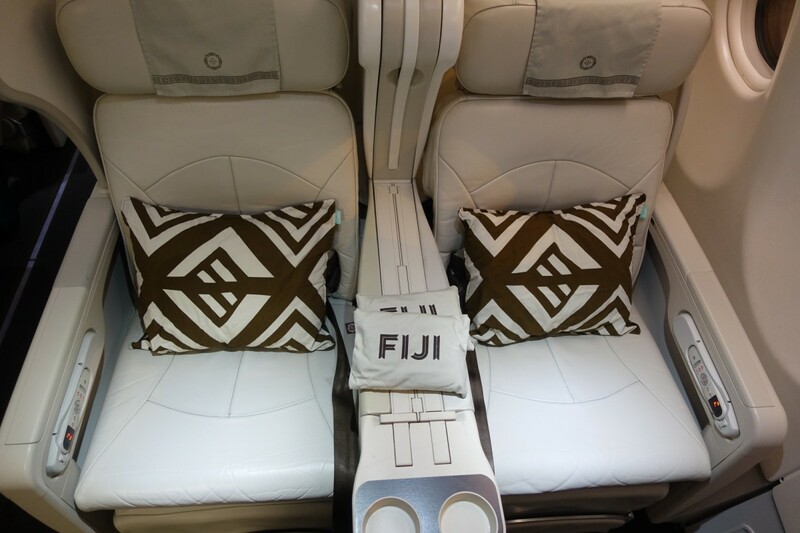 The Fiji Airways Business Class seat is 21 inches across, which is apparently also the seat width for the armchair in the New Singapore Suites on the A380 (although to be fair, there is also a separate bed). 21 inches is what I consider the minimum for international business class, even though Air Tahiti Nui manages to be a half inch less. 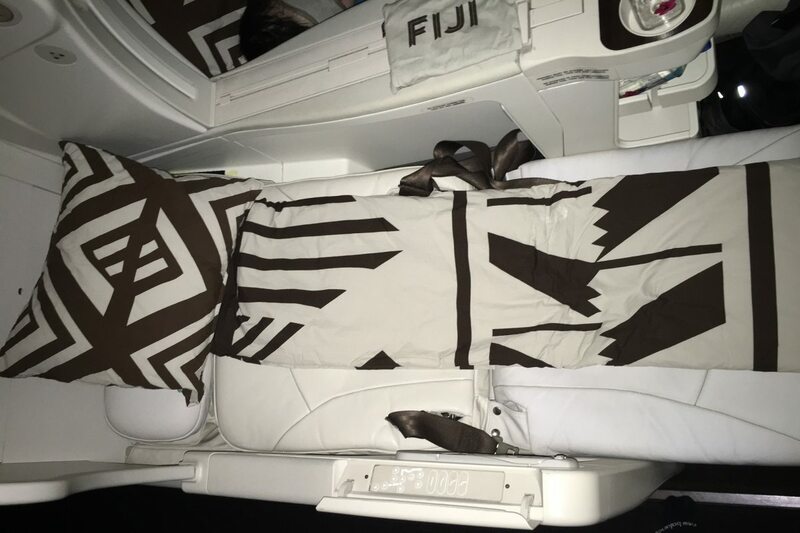 Fortunately, the Fiji Airways seat, although also angled flat, reclines 170 degrees, much better than Air Tahiti Nui Business Class, which only reclines 154 degrees. 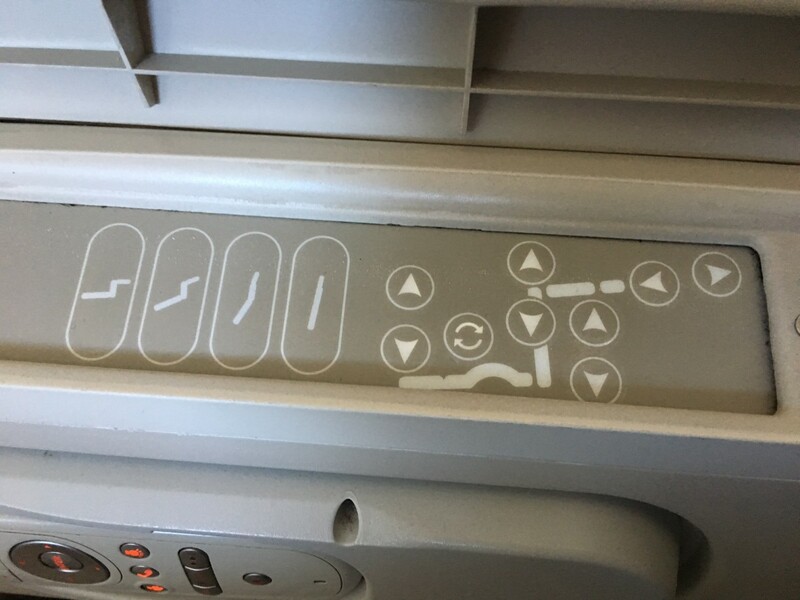 The seat controls enable you to recline to several pre-set positions, or to fine-tune the seat back or leg rest positions. 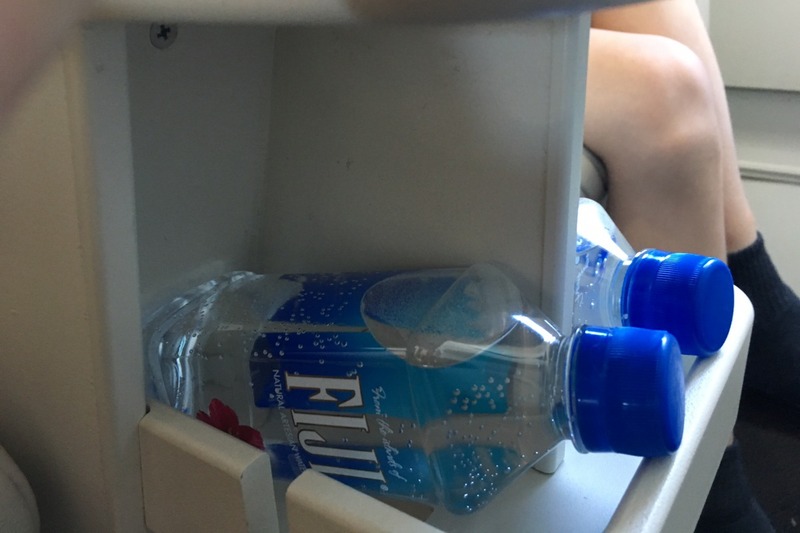 Beneath the IFE screen are two storage compartments for smaller items, such as phones or eyeglasses–just don't forget them there at the end of the flight. 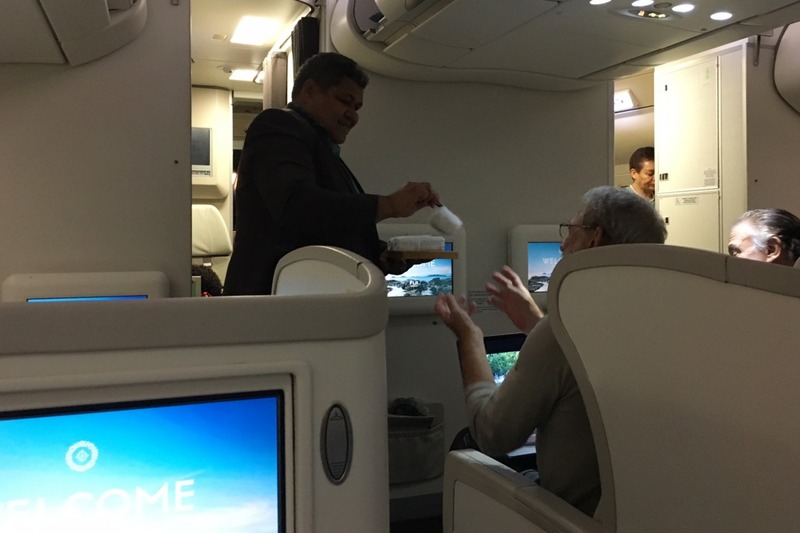 Here's my Fiji Airways Business Class Video Review; Subscribe to TravelSort's YouTube Channel to be alerted to future first class and business class airline reviews and luxury hotel reviews. We were offered a pre-flight welcome drink after settling into our seats. I took the tropical lemonade drink, and my son chose apple juice. Pre-dinner drinks were served with pretzels, which weren't too tempting, so I opted to save room for dinner. Fortunately the actual appetizer, Poached Prawns with Coconut Lime Dressing and Roasted Sweet Potato, was quite good. 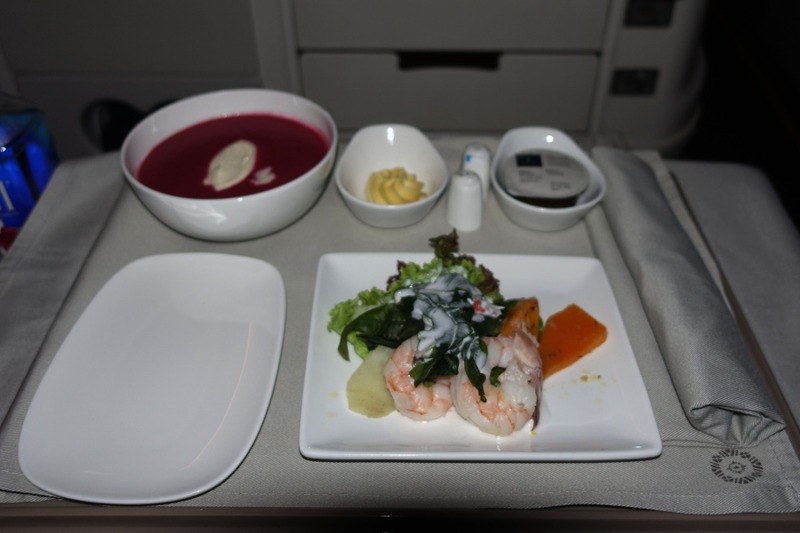 I also really enjoyed the Beetroot Soup, which I spied as a light dinner offering for those who just wanted a soup and salad as a light meal before sleeping. 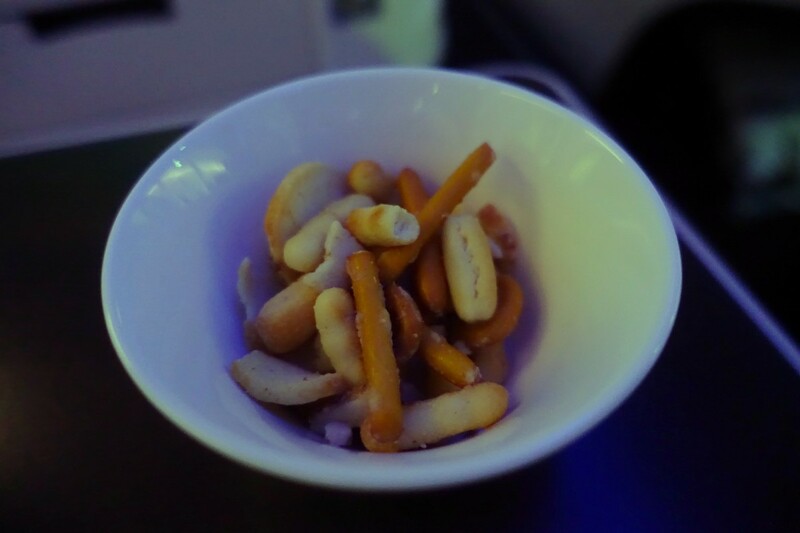 The flight crew graciously accommodated my request to have it as part of my full meal, however. 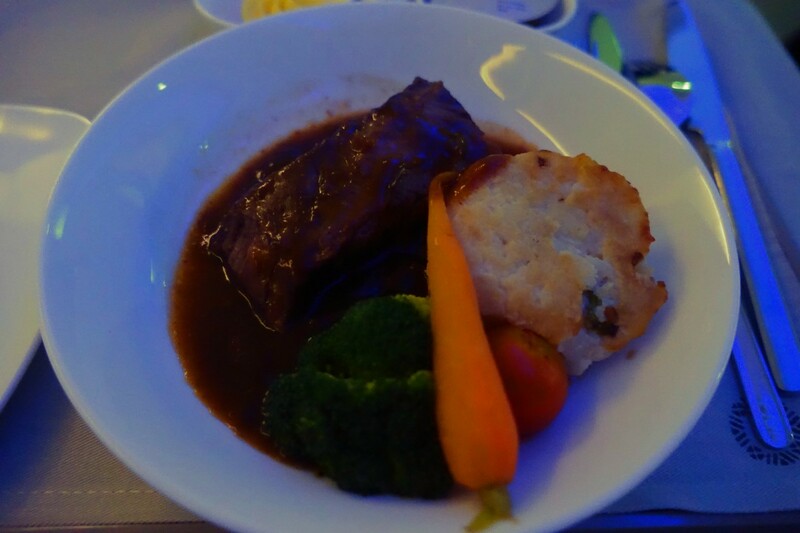 I chose the Slow Cooked Beef Ribs with Potato Mash as my main. 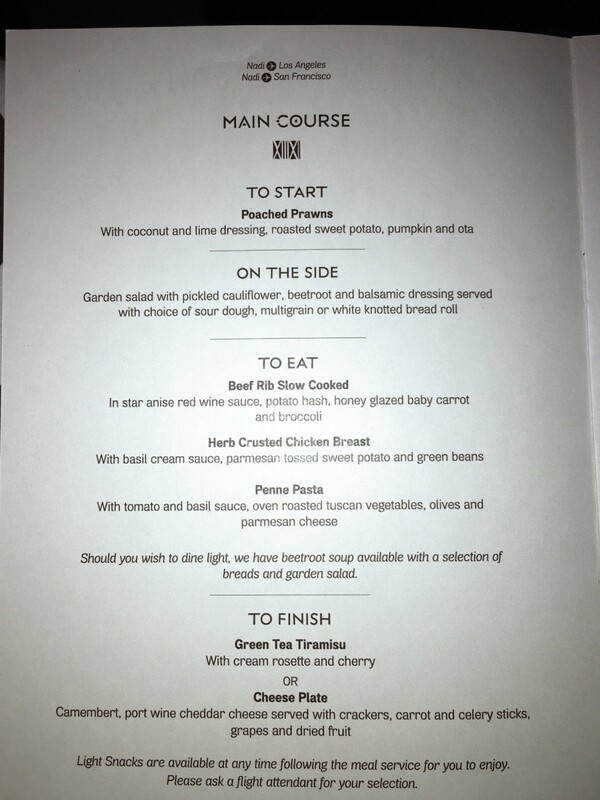 The meat was very tender, as I'd hoped for a slowly braised meat, although I was a bit disappointed that the star anise flavor was barely detectable, and that overall the dish, while rich, was rather flavorless. 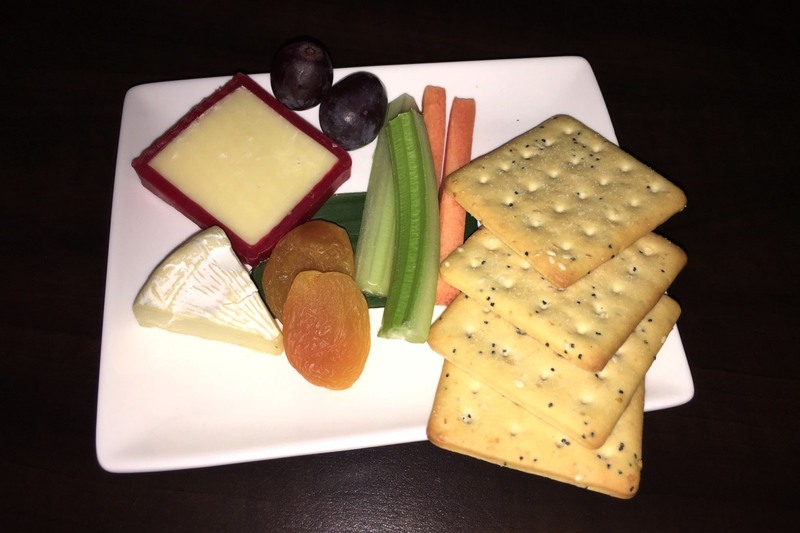 My husband, since he'd dined in the lounge, contented himself with a cheese plate, although it was one of the more basic and meager cheese plates I've seen with only a bit of brie and some cheddar, plus some dried out carrots, celery, crackers and grapes. I tried the Green Tea Tiramisu, which I didn't care for at all. 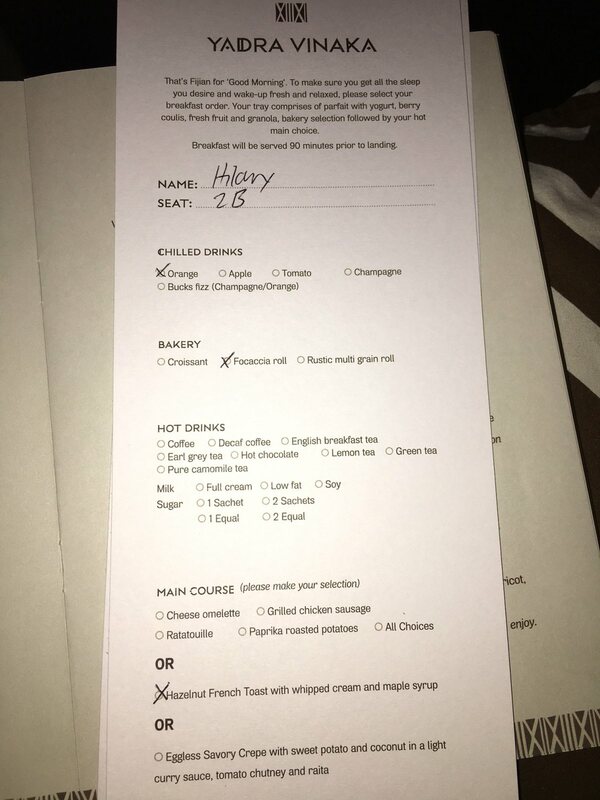 Very few airlines excel where desserts are concerned, however. About the best you can hope for is that they'll be like Qantas First Class and proffer high quality Amedei chocolates. There were no such chocolates on Fiji Airways, but the Hazelnut French Toast I'd ordered for breakfast did seem to have some Nutella in it. 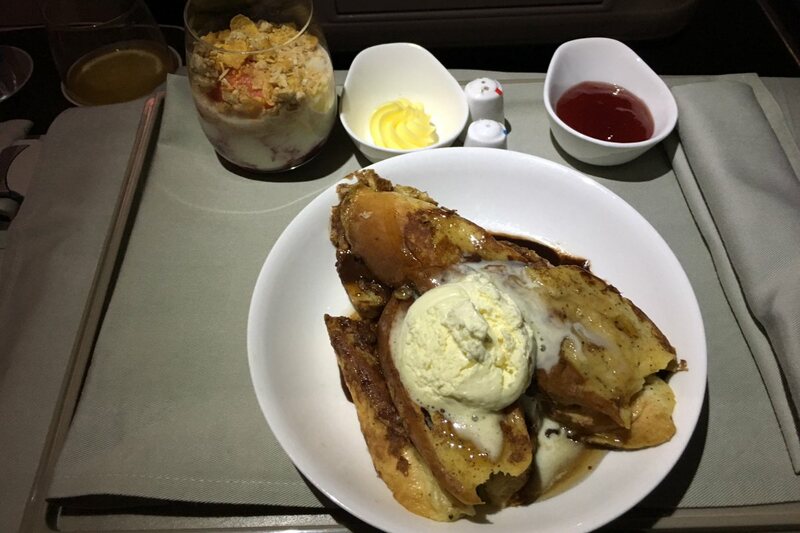 It was actually some of the better French Toast I've had on an airline, even though I wish they'd upgrade the Nutella to Rigoni di Asiago's organic Nocciolata, which is much higher quality chocolate hazelnut spread. The yogurt was quite decent as well, but I would have appreciated real granola with it, instead of the cornflakes and puffed rice cereal that topped it. 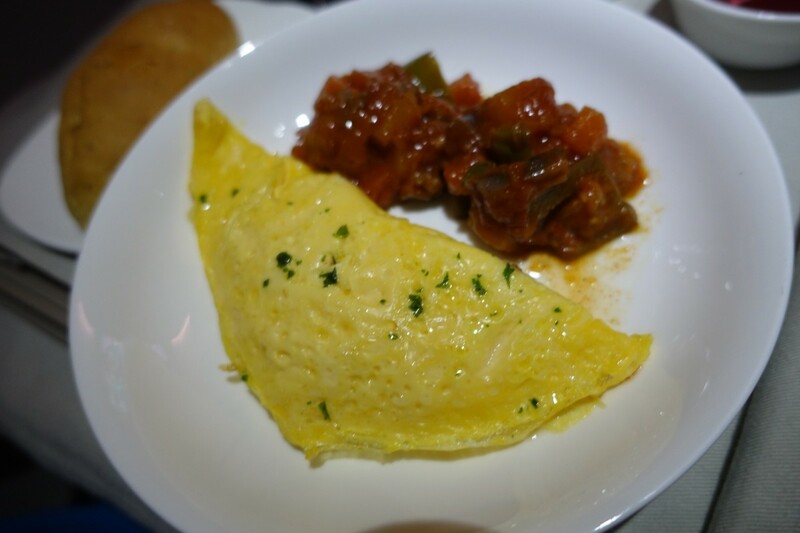 I'd ordered the omelet with Ratatouille for my son, as I wasn't surprised that he liked the omelet but not the Ratatouille, since he's not a huge fan of eggplant. But I tried some and it was pretty good. 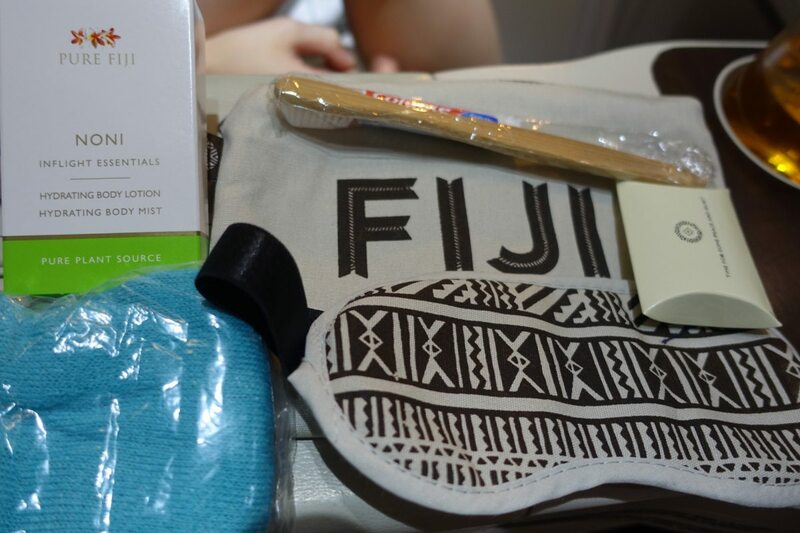 The Fiji Airways Business Class amenity kit is a simple cotton bag with Fiji on it, and the basics: a sleep mask (unfortunately the straps weren't long enough and it pressed too tightly against my eyes, as most airline sleep masks do), earplugs, a dental kit, lotion, and turquoise compression socks). Although angled flat, the 170 degree recline definitely provided a much better sleep experience than Air Tahiti Nui. With a sleep aid, I was able to sleep a few hours and arrive at LAX relatively rested, which is unusual for me, especially since I'd given the Therm-a-rest to my husband to use for this flight and was just using the duvet as a mattress pad. 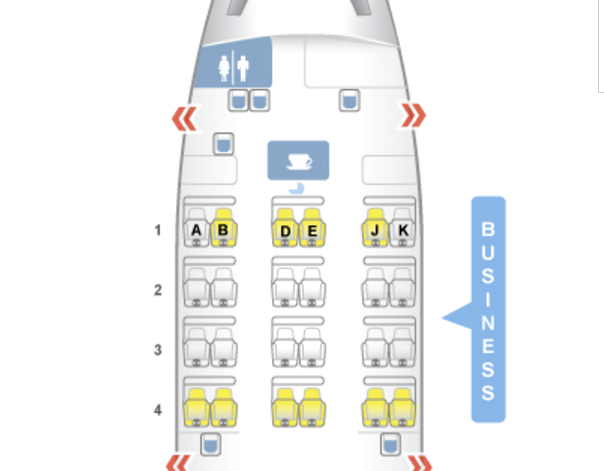 The problem, as I mentioned above, is that it's extremely awkward for window class passengers to get in and out of their seats when the aisle passenger is reclined or has his/her seat in bed mode. So if you hate either climbing over a seat mate or being climbed over and potentially woken up, be sure to avoid the paired window seats and select one of the middle seats, so that you have direct aisle access and no one climbing over you. 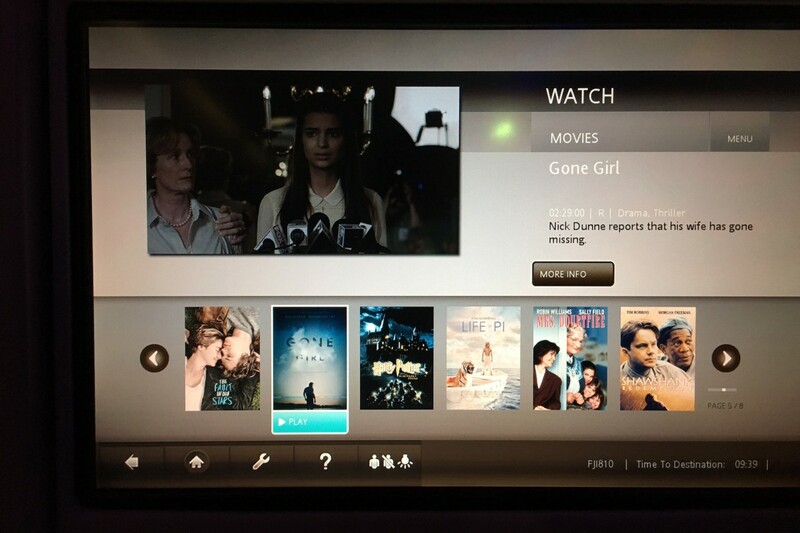 Naturally the Fiji Airways IFE doesn't offer the variety of Singapore KrisWorld or Cathay Pacific, but I was pleased to see a number of award winning and Oscar nominated films. I rewatched some of Gone Girl, enjoying Rosamund Pike's brilliant performance even more the second time. 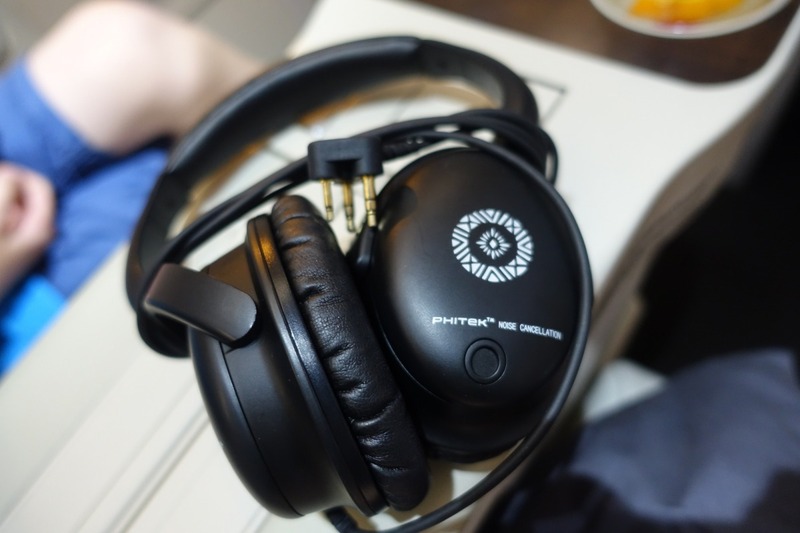 Phitek noise cancelling headphones are provided. Fiji Airways doesn't have any competition on its U.S. flights, and Fiji is a leisure destination, so there's not much of an incentive to offer a great business class product (although Fiji Airways does compete with Air New Zealand on its New Zealand routes, and with Virgin Australia on its Australia flights). 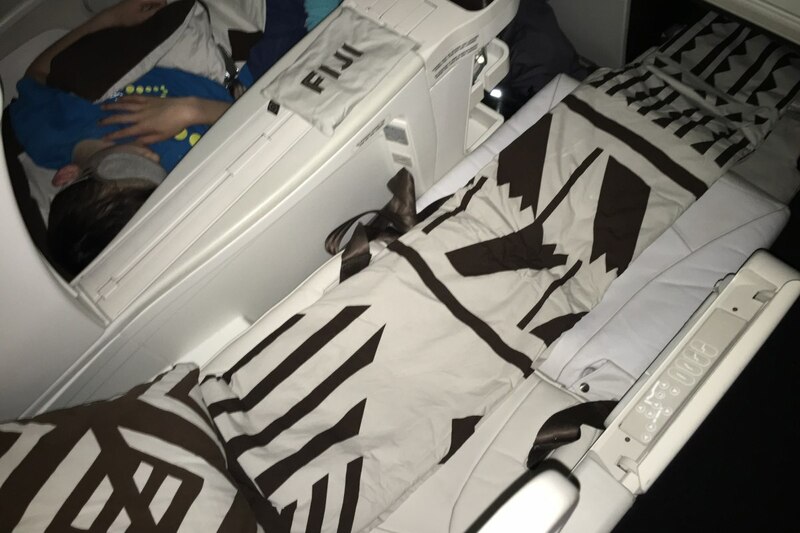 So a fair comparison is Air Tahiti Nui, and I can say I definitely prefer Fiji Airways, both the hard product, given the greater recline of the seat, and the soft product, since the food and even the service has been better than on my Air Tahiti Nui flights. 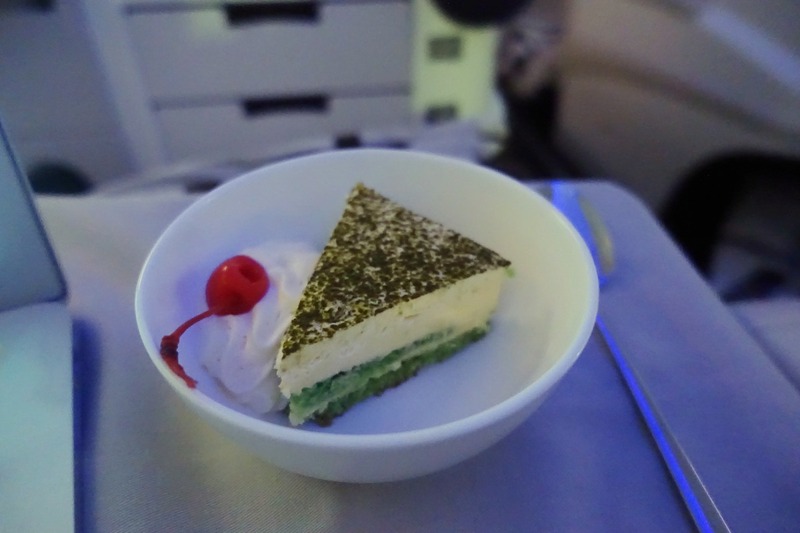 In fact, when I was going to the lavatory to brush my teeth, and the flight attendants were sharing a home baked cake, they even invited me to have some. Whatever the Fiji equivalent is of the Hawaiian aloha spirit was alive on my flight. 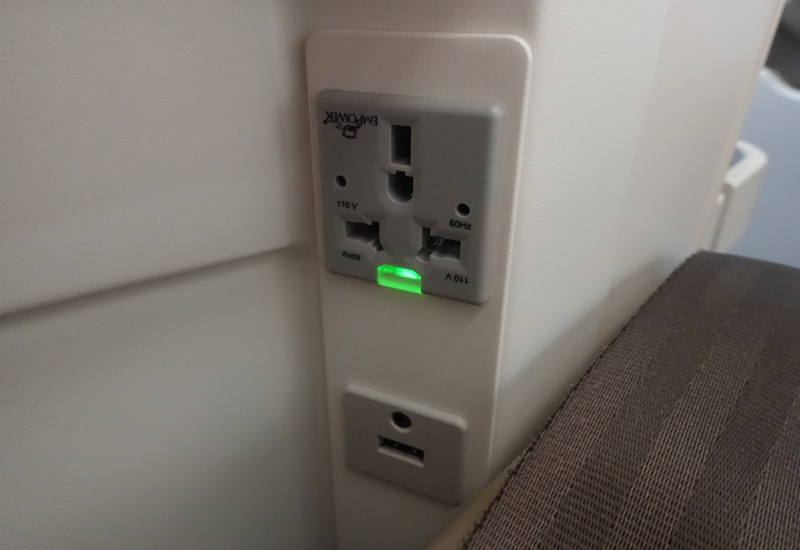 Sure, there were a number of aspects that won't compare favorably to the best international business class products, but given the leisure market Fiji Airways serves and lack of competition, it's surprisingly good. 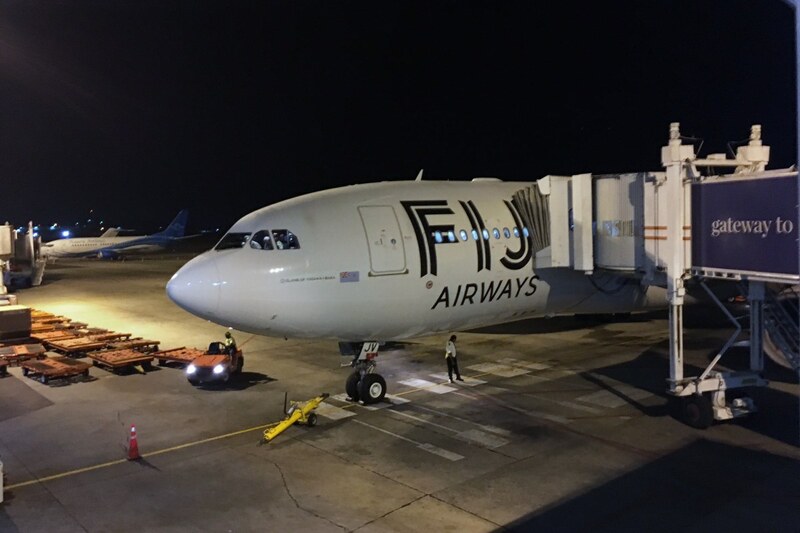 If you've flown Fiji Airways Business Class, what was your experience?